Sunrisers Hyderabad will be aiming to bounce back from a hat-trick of defeats as they host table-toppers Chennai Super Kings in the Indian Premier League on Wednesday in a repeat of the 2018 final. The Kane Williamson-led side lost to Delhi Capitals in their most recent outing. Before the Kiwi returned to the helm, there were defeats against Kings XI Punjab and Mumbai Indians in the two matches prior to that. The 11th edition runners-up are on sixth position in the points table after a disappointing first half of the season. A lot of the focus in the match will also be on Ambati Rayudu, who missed the World Cup bus on Monday. The 33-year-old’s Team India snub is, perhaps, the sole disappointment in an otherwise superb tournament so far for Mahendra Singh Dhoni’s CSK as they are just a win away from effectively clinching a playoff berth. Rayudu had found some form with a half-century against Rajasthan Royals and the flamboyant batsman, who was seen as a sure-shot No 4 in the national team not too long ago, may just channelise the disappointment against a faltering Hyderabad. And to add to the occasion, the CSK batsman’s thinly veiled dig at Tamil Nadu allrounder Vijay Shankar’s selection certainly makes things interesting — the latter, of course, playing for SRH. Barring Warner’s 400 runs and Bairstow’s 304 runs, the next best is World Cup-bound Shankar’s 132 runs. When you consider the fact that the English-Australian duo are not likely to be around for much longer, the Hyderabad franchise need to desperately win their next few matches to reach the playoffs. In fact, Pathan has been surviving on past reputation for years now and has not played a match-winning knock for a long time. Having been excluded from the first XI now, it’s hard to see him make a comeback soon. The man who has been a revelation for CSK this season is 40-year-old Imran Tahir with 13 wickets. The South African import has executed his skipper’s plans brilliantly. If there is an area of immediate concern for CSK, it’s the form of opener Shane Watson (centurion against SRH in 2018’s final) who has only managed 67 runs in his last six innings this year. For Sunrisers to remain relevant in this edition, they need to stop the CSK juggernaut, which is easier said than done. It is the first time in four seasons that SRH have lost two consecutive matches at home. They are also on a four-match losing streak against CSK after losing all their encounters in the 2018 edition. Williamson and Co would dearly love for both those streaks to come to an end on Wednesday in front of their home fans. Overall: Matches – 10, Sunrisers Hyderabad – 2, Chennai Super Kings – 8. 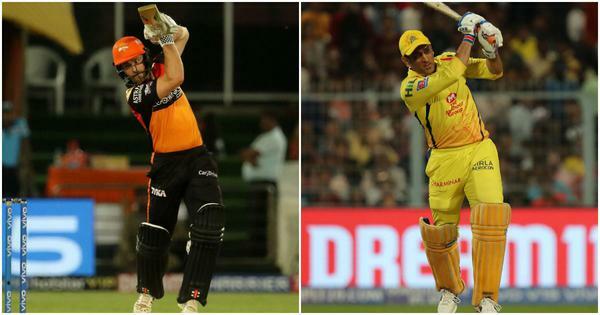 In 2018: Matches – 4, Sunrisers Hyderabad – 0, Chennai Super Kings – 4. Sunrisers Hyderabad: Kane Williamson (captain), Basil Thampi, Bhuvneshwar Kumar, Deepak Hooda, Manish Pandey, T Natarajan, Ricky Bhui, Sandeep Sharma, Siddarth Kaul, Shreevats Goswami, Khaleel Ahmed, Yusuf Pathan, Billy Stanlake, David Warner, Rashid Khan, Mohammad Nabi, Shakib Al Hasan, Jonny Bairstow, Wriddhiman Saha, Martin Guptill, Vijay Shankar, Abhishek Sharma, Shahbaz Nadeem. Chennai Super Kings: MS Dhoni (captain & wk), Suresh Raina, Ambati Rayudu, Shane Watson, Faf du Plessis, Murali Vijay, Kedar Jadhav, Sam Billings, Ravindra Jadeja, Dhruv Shorey, Chaitanya Bishnoi, Rituraj Gaikwad, Dwayne Bravo, Karn Sharma, Imran Tahir, Harbhajan Singh, Mitchell Santner, Shardul Thakur, Mohit Sharma, KM Asif, Deepak Chahar, N Jagadeesan (wk), Scott Kuggeleijn.